As a dating coach, pretty much everywhere I go there are guys that are wondering how to get a girlfriend to embellish their lives. They want love, attraction, lust, someone to watch movies with and of course, someone to make love to. Unfortunately, the guys that say they need a girlfriend … well, most of the time, they are also the least likely guys to get one. That’s because a lot of the time, those guys come from a place of need. If you’ve ever heard the term “being needy”, then that’s exactly what we’re talking about. If you’ve ever said: “If only I had a girlfriend, then everything would be O.K. and I’d be happy”, then you”re looking for a girlfriend in order to fix your life. This is a huge mistake, but we’ll fix it! The primary step in actually getting a girlfriend is to come from a place of abundance and happiness. Girls will be attracted to you if you’re already content with your life and you’re not looking at them to fill some emotional or physical need that needs filling. Why is that? Well, for one, being needy screams of desperation. Being desperate means that no one else wants you, which consequently lowers your social status and makes you very unattractive. Not to mention, being needy is just annoying, repelling and definitely not something you want in your life. That being said, there is a huge difference between being needed and being wanted. If you go completely in the opposite direction and you pretend you don’t care at all for a girl, you definitely won’t be any closer to getting a girlfriend in your life. Everyone wants to feel wanted… but for the right reasons. When you’re with a girl that seems to be girlfriend worthy, then make sure she knows, consciously or unconsciously, why you like her. For example, if she makes you laugh, then just laugh. You can also tell her that she’s witty or cute when she’s clumsy… depending on the circumstances. All that matters is that the girl in question knows that you’re interested in her for the right reasons. If you simply want a girlfriend as a status symbol, because you feel that she’ll fix everything in your life or simply because you believe that you’ll have more chances of sleeping with her, then she’ll very likely reject you at your first approach. Instead, make sure she knows why you like her, and have genuinely good reasons that you disclose slowly and subtly over time. Do not, under any circumstances, start professing your love, listing all the reasons why she’s the love of your life. You may have seen such a scene in a movie, where the guy gets the girl by telling her every last little detail about why he likes her, but in reality (and remember, that’s where we live), that simply doesn’t work. In fact, it’s quite the opposite. Having someone profess their undying love for you is… well, kind of awkward at best and repelling most of the time. Instead, the next time she does something you like, simply let her know that you noticed it and you enjoy what she did. Then move on and act as if you never said anything. Eventually, she’ll realize that you like her for the right reasons. So how can you make the switch from being needy to being happy without a girlfriend? Well, the path will differ for many, and on your journey, you’re likely to find a girlfriend without even trying. However, let’s assume you’re already coming from a place of abundance, you’re already happy with your life and you want a girl for the right reasons… then what? Assuming you already have a girl in mind, the next step you need to take is to spend time with her. The more time you spend with her, the more you are to form a relationship with her. The one commonality that couples have is the following: they all spend a lot of time with each other. Even in long distance relationships, the couples usually end up talking to each other for hours every day. Therefore, if you want any chance of getting a girlfriend, you’re going to have to see her a few times a week. Even though how often you see each other is very important, it’s actually the progression that is even more important. Allow me to explain. When you first meet a girl, you’re usually going to go out once or twice per week together. Then, as things progress, you’ll end up spending 3-4 days a week together, at which point the relationship will naturally turn into a boyfriend and girlfriend relationship, assuming there is attraction involved. The problem that many guys encounter is that they simply go completely overboard too quickly. Although the progression rate varies tremendously from person to person, if you start calling a girl and asking her to hang out every single night, you’ll come across as needy, which as we covered, is not what we want. Instead, I advocate spending as much time as you want together without it feeling forced. If you lead a relatively empty life and she’s really busy, then you’ll want to match her busy life and hang out maybe once a week at the start. 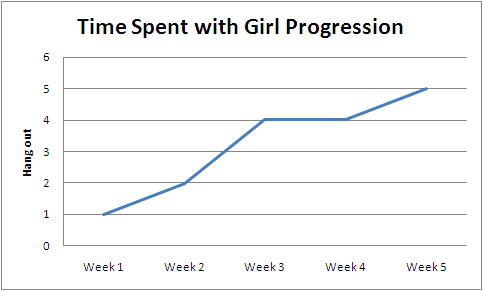 By contrast, if she’s free most of the time, then you can can progress much quicker. Ideally, find a girl with as much free time as you, that way you won’t be bored when she’s busy. Finally, the last crucial part of getting a girlfriend is building attraction. Without attraction, you’ll forever get caught up in the “Let’s just be friends” zone which is far from what you want when you like a girl. Remember that attraction is a fire that can be ignited if you mix the right elements together. Make sure to read up on the numerous articles on how to create attraction on How-To Seduction, and refer anyone in need to this how to get a girlfriend article.